We evaluated 119 women; 7.5% of them had a family history of breast cancer. Their average body mass index was 28.7 ± 5 kg/m2, and the mean surviving time was 7.3 ± 1.9 years [Table 1]. Most were between 50 and 69 years (72%); 91 women (76.4%) had overweight and obesity, and 53 (44.5%) presented impaired fasting glucose. In those with normal weight (n = 28), impaired fasting glucose occurred in 9 (32.1%); however, in overweight participants (n = 48), it occurred in 22 (45.8%) and in obese participants (n = 43) in 22 (51.1%). The central glucose was rising according to body mass index [Table 2]. Edgington A, Morgan MA. Looking beyond recurrence: Comorbidities in cancer survivors. Clin J Oncol Nurs 2011;15:E3-12. Valdivieso M, Kujawa AM, Jones T, Baker LH. Cancer survivors in the United States: A review of the literature and a call to action. Int J Med Sci 2012;9:163-73. Cardenas SJ, Bargalló RE, Erazo VA, Maafs ME, Poitevin CA. Mexican Consensus on Breast Cancer Diagnosis and Treatment. Vol. 5. Elsevier; 2015. p. 3-112. Available from: http://www.google.com.mx/url?sa=t&rct=j&q=&esrc=s&source=web&cd=2&ved=0ahUKEwjm07a08O7OAhUP6mMKHacOCjAQFggjMAE&url=http%3A%2F%2Fwww.comesama.org%2F_literature_182436%2Ffolleto_consenso&usg=AFQjCNGYThdHIF-ptQP7tajxKkXSyCiStQ&sig2=LeowMDNt-Y0S1agcQbdXog. [Last. [Last accessed on 2018 May 03]. Lajous M, Mozaffarian D, Mozaffarian R, Schrag D, Adami HO. Lifestyle prescriptions for cancer survivors and their communities. J Intern Med 2011;269:88-93. 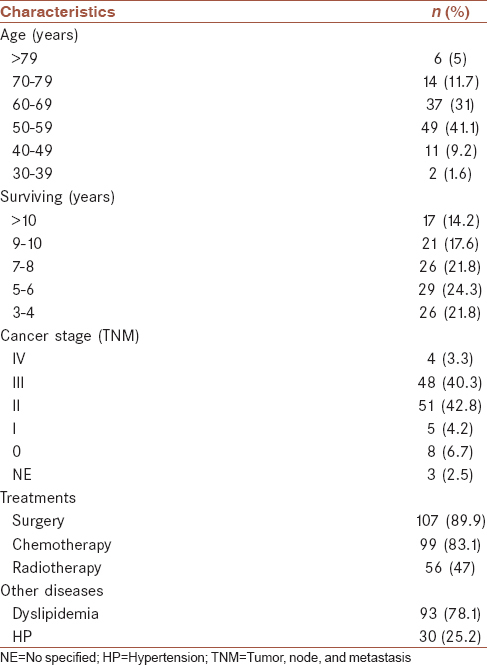 Ganz PA. Survivorship: Adult cancer survivors. Prim Care 2009;36:721-41. Thomson CA, Thompson PA, Wright-Bea J, Nardi E, Frey GR, Stopeck A, et al. Metabolic syndrome and elevated C-reactive protein in breast cancer survivors on adjuvant hormone therapy. J Womens Health (Larchmt) 2009;18:2041-7. Lu LJ, Wang RJ, Ran L, Gan L, Bai Y, Jin LB, et al. On the status and comparison of glucose intolerance in female breast cancer patients at initial diagnosis and during chemotherapy through an oral glucose tolerance test. PLoS One 2014;9:e93630. Villarreal-Garza C, Shaw-Dulin R, Lara-Medina F, Bacon L, Rivera D, Urzua L, et al. Impact of diabetes and hyperglycemia on survival in advanced breast cancer patients. Exp Diabetes Res 2012;2012:732027. Ortiz-Mendoza CM, de-la-Fuente-Vera TA, Pérez-Chávez E. Metabolic syndrome in Mexican women survivors of breast cancer: A pilot study at a general hospital. Med Arch 2014;68:19-21. Guerrero-Romero F, Rodríguez-Morán M, Pérez-Fuentes R, Sánchez-Guillén MC, González-Ortiz M, Martínez-Abundis E, et al. Prediabetes and its relationship with obesity in mexican adults: The mexican diabetes prevention (MexDiab) study. Metab Syndr Relat Disord 2008;6:15-23. Stocks T, Rapp K, Bjørge T, Manjer J, Ulmer H, Selmer R, et al. Blood glucose and risk of incident and fatal cancer in the metabolic syndrome and cancer project (me-can): Analysis of six prospective cohorts. PLoS Med 2009;6:e1000201. Huang Y, Cai X, Qiu M, Chen P, Tang H, Hu Y, et al. Prediabetes and the risk of cancer: A meta-analysis. Diabetologia 2014;57:2261-9. Huang Y, Cai X, Mai W, Li M, Hu Y. Association between prediabetes and risk of cardiovascular disease and all cause mortality: Systematic review and meta-analysis. BMJ 2016;355:i5953.